We investigated the usefulness of the minimum ADC value of primary breast lesions for predicting axillary lymph node (LN) status in luminal A-like breast cancers with clinically negative nodes in comparison with the mean ADC. 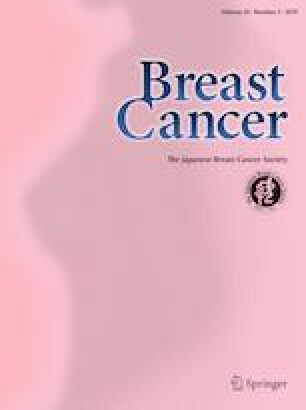 Forty-four luminal A-like breast cancers without axillary LN metastasis at preoperative clinical evaluation, surgically resected with sentinel LN biopsy, were retrospectively studied. Mean and minimum ADC values of each lesion were measured and statistically compared between LN positive (n = 12) and LN negative (n = 32) groups. An ROC curve was drawn to determine the best cutoff value to differentiate LN status. Correlations between mean and minimum ADC values and the number of metastatic axillary LNs were investigated. Mean and minimum ADC values of breast lesions with positive LN were significantly lower than those with negative LN (mean 839.9 ± 110.9 vs. 1022.2 ± 250.0 × 10− 6 mm2/s, p = 0.027, minimum 696.7 ± 128.0 vs. 925.0 ± 257.6 × 10− 6 mm2/s, p = 0.004). The sensitivity and NPV using the best cutoff value from ROC using both mean and minimum ADC were 100%. AUC of the minimum ADC (0.784) was higher than that of the mean ADC (0.719). Statistically significant negative correlations were observed between both mean and minimum ADCs and number of positive LNs, with stronger correlation to minimum ADC than mean ADC. The minimum ADC value of primary breast lesions predicts axillary LN metastasis in luminal A-like breast cancer with clinically negative nodes, with high sensitivity and high NPV. This study was supported in part by Japan Society for the Promotion of Science (JSPS) KAKENHI (Grant numbers 26860962 and 17K10389) and supported by Global Station for Quantum Medical Science and Engineering, a project of Global Institution for Collaborative Research and Education at Hokkaido University. K. Kudo received research grants from Hitachi Ltd and Philips Medical systems, as well as lecture fees from Hitachi Ltd, GE Healthcare, Siemens Healthcare, and Toshiba Medical Systems. The other authors have no conflict of interest to declare.